A proposed route leading south from Interstate 78 & U.S. 22, Interstate 178 would have mirrored the function of I-378 at Bethlehem, linking Downtown Allentown with the Lehigh Valley Thruway. A new interchange with the Lehigh Valley Thruway would have joined the north end of the Allentown Spur Route, west of Airport Road and east of the Lehigh River. The south end of the Allentown Spur Route was planned for the area of 3rd and Hamilton Streets, east of Jordan Creek and Downtown Allentown. 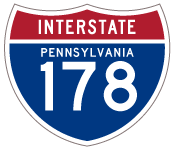 For more information on decommissioned Interstate 178, visit Pennsylvania Highways: Pennsylvania’s Dearly Departed Interstates. “American Parkway built instead of spur route.” The Morning Call, June 7, 2002. “American Parkway Bridge in Allentown opening Tuesday.” The Morning Call, November 23, 2015. “Crews making progress on American Parkway Bridge in Allentown.” Lehigh Valley News, May 12, 2014.